Hello Fellow Brand Lovers, Today, I came across a very interesting post regarding the winner of the Next-Gen PC Design Competition and the first place winner, the Napkin PC. This is a product that is both innovative and green. The future of product and technological innovation is being redefined. Now, it is not enough to have an cool idea, now you must fully integrate form + function. And, you must have a sustainability component fully integrated into the core rather than simply “green washing” your concept. Keep an eye out on the product horizon…this is just the beginning. 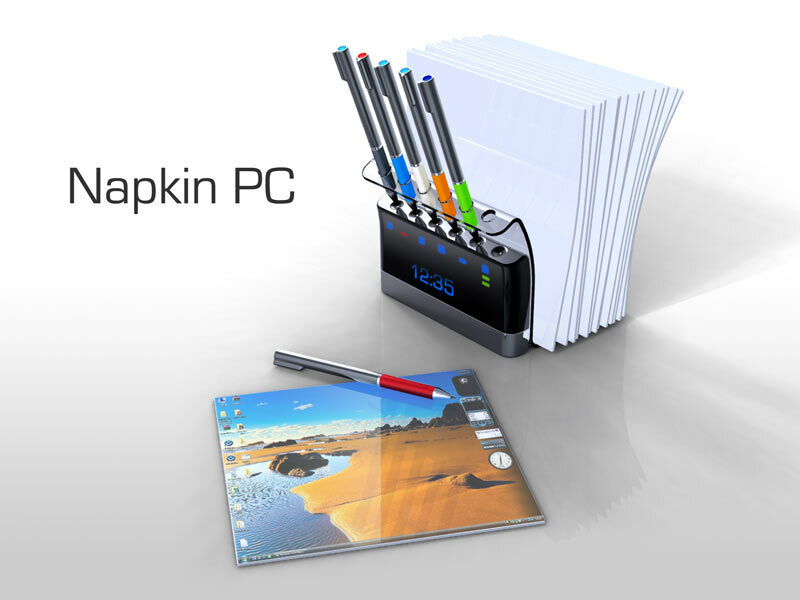 The Napkin PC aims to bring out the creative passion of the user both individually and in group sessions. It encourages spreading out and allows for multiple creative workflows that can interact or just as easily stay independent. It encourages group interaction and collaboration by allowing any number of interfaces that can be passed around or pinned up, but which all communicate with a central network. The primary users are creative professionals including those in any field of design, but also expanding to include business and marketing professionals who use creative thinking to come up with business plans or marketing campaigns. Their primary need is to have a simple system to help keep their creativity moving and maintain good collaborative communication. They want to drink a cup of coffee, pick up a pen and let their creativity flow, without having to sit down later to actually document and organize the information later. The Napkin PC is a continuously additive system, where each new idea is already documented and organized with references and connections to related ideas. In addition each Napkin interface is an instant portal to the entire network giving quick and easy access and sharing of ideas and reference material. The design appeals to business professionals. It is ideal for work groups of around 6 people (a typical brainstorming meeting) although the system is easily expandable for larger business. The viable markets are any business that works with creative professionals. Any company that relies on brainstorming and group collaboration would benefit from using a Napkin PC. A secondary market is creative professionals who work alone or in smaller groups, but who want the same ability to spread out and use multiple workflows. The Napkin PC is innovative because of its multi-flexibility. It can have multiple users, multiple interfaces, and multiple configurations. It breaks the PC down to only the interface— a pen and a space— and then gives you a multitude of both so you can let your creativity run wild. The users are creative professionals who work in collaborative groups. The PC is designed to be used for brainstorming, ideation, meetings, think tanks, etc. — anywhere where creativity is the driving force. There are two new usage scenarios delivered by the PC. First is the brainstorming workflow. Creativity that normally starts on paper and whiteboards goes instead directly into the PC without the user changing their behavior. This creativity is richer because of the innumerable software tools and resources available on every Napkin interface. It can also be shared, compiled, and compared instantly for a smooth, speedy workflow. The second scenario is a replacement for printing. Instead of ever putting ink on paper, the interfaces themselves instantly become “prints” when power is removed. They would then be used just like a print, pinned up, handed around, reviewed, etc. When the print is no longer needed the interface is simply returned to the base station as a fresh Napkin. The interface consists of any number of Napkins and one of the Pens. When powered by the Pen, the Napkin is a multi-touch input display which responds to human touch as well as the Pen. The intuitive use of a pen and paper is exploited by the design, making it very easy to use. Also the ability to work on multiple interfaces in parallel, instead of shuffling through windows on a single interface, makes multitasking much easier. The Base station is designed to interact like a napkin holder. The user can grab an interface from the stack in the middle of the table. The computer itself is somewhat hidden in the Napkin holder, its only reminder being the OLED status display on the front. The user only really interacts with the Napkins and the Pens. This helps them maintain hands-on, creative freedom. The square Napkin form is used because it is modular, but also because it conveys the idea of being one of many. This helps the user stay relaxed and open minded because less importance is put on a single interface. The key technologies are full color e-Paper, multi-touch input, Inductive power circuits, and high speed RF wireless connections. The e-Paper is key because of its low power consumption, thinness and flexibility, and ability to retain an image without power. Multi-touch is simply the future of intuitive input that makes the PC fun, fast, and easy to use. The inductive power circuits are crucial because they allow wireless power transfer and make the interface Napkin simple and inexpensive enough to be used in large numbers. High speed RF continues to keep everything wireless and intuitively seamless. The environmental sustainability of the PC is most innovative with the Napkin interface. It is the most numerous component and the one most likely to need replacing due to wear over a few years. Therefore it is beneficial to make it easy to recycle which is accomplished by powering it with an inductive circuit. This eliminates a hard-to-recycle internal battery. The second, and likely more impactful, innovation is the use of the interface as an instant “print.” This eliminates the need for printers, paper, and ink, which are used in large amounts during the creative process. The focus of the design is really in the interface – the Napkin and the Pen. Both have very limited actual function because they only relay information between the user and the base station. The Napkins are manufactured by adhering the layers of touch input, display, and power/communication circuit, between a protective plastic cover. The pens have a similar induction circuit and communication antenna set up along with a rechargeable battery to send power to the interface. The Base Station holds the actual PC, which is compact but powerful enough to handle multiple users. Angela Hill is the President/Creative Director of Incitrio, a branding agency that provides analysis, strategy and tactics for sustainable and clean tech brands around the world.